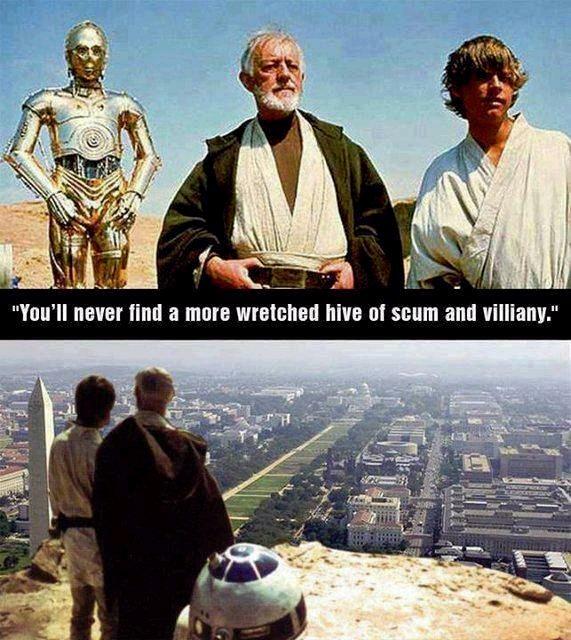 It’s always the right time to make fun of our overlords in Washington. Sometimes we can laugh at cartoons, like this portrayal of a politician and lobbyist interacting. In other instances, we can enjoy good jokes, such as the blind rabbit who finds a politician. Or we can be amused by satire, such as these excerpts from Dave Barry. Today, though, we have a very good image. Fans of Star Wars will appreciate these words of wisdom from Obi-Wan Kenobi. You can read about how these men and women spend their time screwing us and wasting our money. And we have some examples of what people in Montana, Louisiana, Nevada, and Wyoming think about big-spending politicians. This little girl is rather blunt about our political masters, here are a couple of good images capturing the relationship between politicians and taxpayers, and here is a somewhat off-color Little Johnny joke. Last but not least, let’s not forgot to include this joke by doctors about the crowd in Washington. P.S. If you want humor specifically targeting Obama, you’ll enjoy this Pope message, this Pennsylvania joke, this Reagan-Obama comparison, this Bush-Obama comparison, this sign, this video satire, and this bumper sticker.